The Dr. John T. Macdonald Foundation Biomedical Nanotechnology Institute, BioNIUM, was created in 2012 thanks to a gift from the Dr. John T. Macdonald Foundation, along with matching funds provided by the Office of the Provost of the University of Miami, as well as by contributions from the College of Arts and Sciences, College of Engineering, and the Miller School of Medicine. With the establishment of the BioNIUM, the University of Miami aimed at providing the community with the infrastructure, resources, and unique expertise needed for the design and fabrication of materials and devices at the micro- and nanoscale. 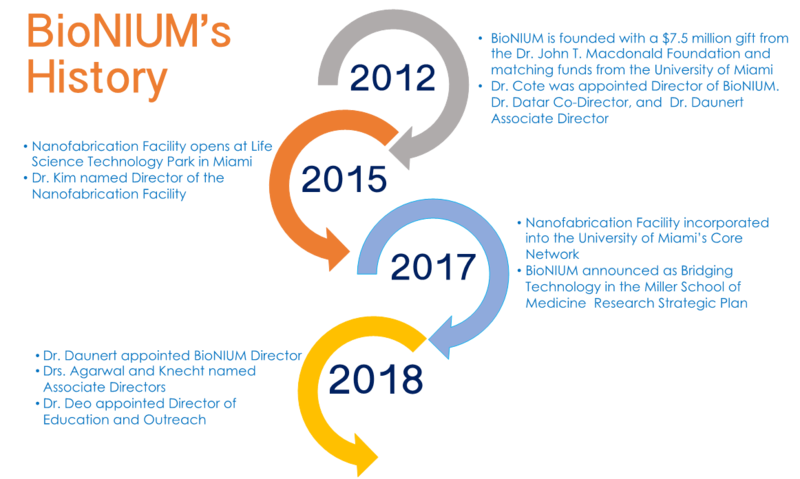 Since its creation, the BioNIUM serves as a hub to foster multidisciplinary interactions and team science research among faculty, students, and scientists within the University of Miami and South Florida’s industrial and business communities.